". . . Tush! As good dissemble that thou never mean'st As first mean truth and then dissemble it: A counterfeit profession is better Than unseen hypocrisy." Having obtained the hoard, Barabas buys a palace to shame the Christians, and plots vengeance against the governor of Malta and incidentally against Mathias, the Christian lover of Abigail. By means of a forged letter he brings Mathias and Lodowick, son of the governor, into a duel, in which both die. When Abigail learns of her father's deed, through his slave Ithamore, she turns Christian and retires to the nunnery, her former home. On hearing this, Barabas sends poisoned broth to the nuns. Abigail, dying, confesses her father's villainy to the two friars, Jacomo and Bernardine, and they become the next victims of Barabas' wrath. He lures Bernardine into his home by promises of money, and, aided by Ithamore, strangles him. Then he placesthe dead body in a natural attitude. When Jacomo arrives he becomes jealous of his brother friar and brains him. Thereupon Barabas turns him over to the authorities, who hang him on a charge of murder. In the mean time Ithamore has been ensnared by Bellamira, a courtezan; and to her and her lover, Pilia-Borza, he confesses. They seek to blackmail Barabas; and he kills them by means of poison sprinkled on flowers. When taken into custody, he swallows a sleeping-draft of "poppy and cold mandrake juice." He is left for dead, and betrays the city into the hands of the Turks, who make him governor. "Die, life! fly, soul! tongue, curse thy fill, and die!" Such is Barabas, the embodiment of devilishness. 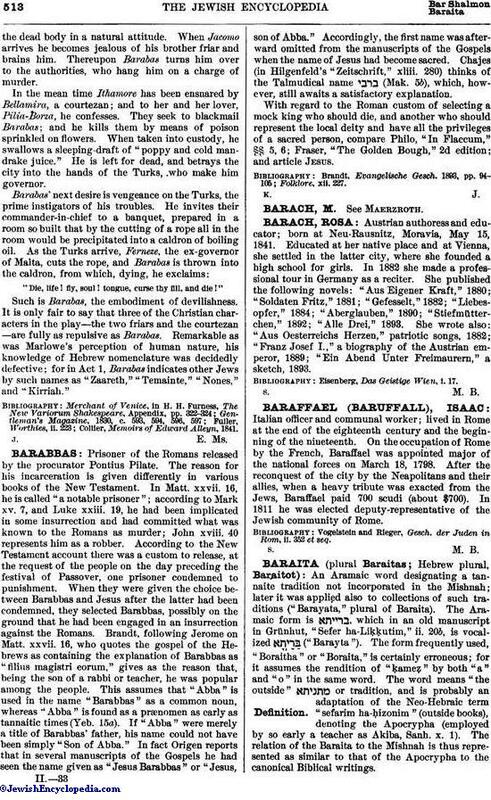 It is only fair to say that three of the Christian characters in the play—the two friars and the courtezan —are fully as repulsive as Barabas. 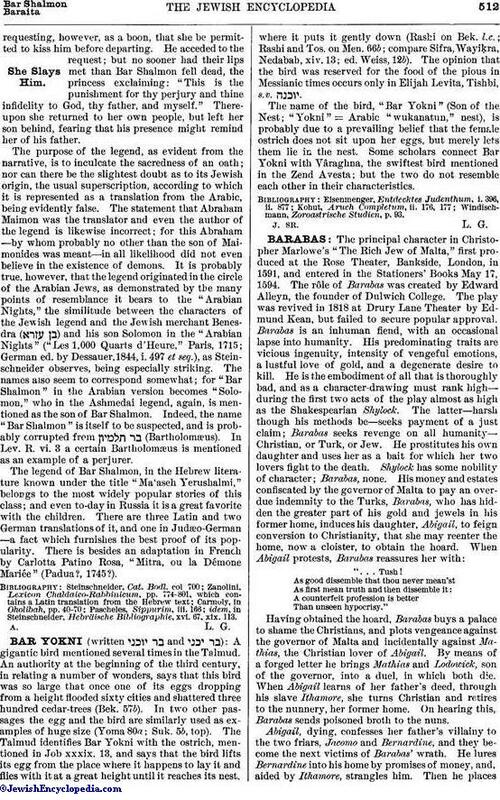 Remarkable as was Marlowe's perception of human nature, his knowledge of Hebrew nomenclature was decidedly defective; for in Act 1, Barabas indicates other Jews by such names as "Zaareth," "Temainte," "Nones," and "Kirriah." Collier, Memoirs of Edward Alleyn, 1841.